Game 3 of Navara - Svidler match has started in Prague several minutes ago. Czech GM is behind his rival and has white pieces. The 1st match game of Navara - Svidler will start today in Prague at 18:00 MSK Time. Czech GM plays White. The 4th game of Navara - Svidler friendly match has started in Prague at 18:00 MSK Time. This is the last game of the match; as you remember Russian GM has already won the match. Today he is playing white. Game 2 of the Navara - Svidler has started several minutes ago in Prague. The match is held in the framework of the festival Cez Chess Trophy. Let us remind you that the opponents will play overall four games. The 5th game of the friendly match between Nepomniachtchi - andreikin has started at 15:00 MSK Time. The former champion of Russian has White for the last time in the match. You can follow the game live. 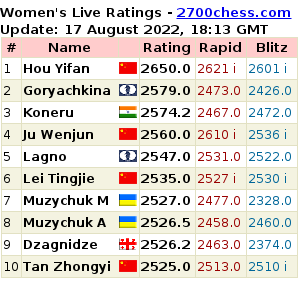 The match between the first rated GM in Czech Republic David Navara and the world #2 among women Hou Yifan has started today. The rivals will play four classical games. You can follow live streaming on the official website. The 3rd game of the World Championship match has started several minutes ago in the Tretyakov Gallery; this time the Indian player is White. The Grunfeld defence is played again, however, the world champion chose another line than in the first match game already on move 3. 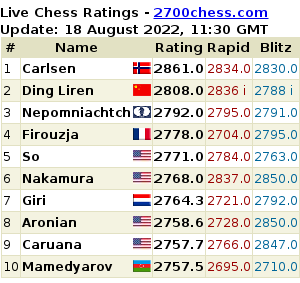 Watch the game live, follow news on our website and Twitter page, listen to the Chess-News radio which will gather several interesting guests. As last year, the Czech GM has the white pieces at the start of his match with an American opponent. The match against Nakamura went very badly for Navara, and now he pits himself against Wesley So. The match consists of four games with a time control of 90'+30'+30''. Round 6 of the men's and women's superfinals have started after a free day. You can follow the games live, our correspondent Elena Klimets is working on the spot. The 5th game of the World Championship match Anand - Gelfand started at 15:00 MSK Time in the State Tretyakov Gallery. The World Champion is White. Follow us to get all the news from the spot and listen to our Chess-News radio live from the press center. The Ukrainian GM Anton Korobov will join us in commentating the game.